Call or stop by our facility to see first hand! Founded in 1976 by owner and CEO, Tommy Blue, T.H. Blue, Inc. has become one of the largest wholesale manufacturers of potting media and mulches in North Carolina. We are family owned and operated which ensures that the customer’s satisfaction is our highest priority! T.H. Blue, Inc. offers the area’s widest selection of pine and hardwood mulches, as well as soil conditioners, shavings, and certified playground chips. Our materials are offered in a variety of colors, textures, and price ranges. Screening and blending our materials on-site ensures that we control the quality of every product we sell. We encourage you to create your own “specialty mix”, or use one of our tried and true formulas to make your plants and landscapes flourish. We offer our products in bulk form by the cubic yard. For your convenience, we have included an area calculator to help determine the amount needed for your project. It is our recommendation that a minimum of four inches of material is spread over bare ground to achieve optimal results. Our customers are always welcome to bring a pick-up or trailer to be loaded at our yard. We have standard pricing for short and long-bed pick-ups which hold approximately 2 1/2 – 3 cubic yards. 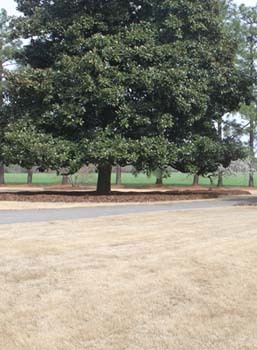 We also have the capability of delivering 5-15 cubic yards to Moore County and it’s surrounding areas. T.H. Blue, Inc. maintains an extensive fleet of trucks with walking-floor trailers capable of delivering up to 100 cubic yards, depending on the material. This allows us the ability to service our customers in a timely manner, often within 48 hours of placing an order. We are growing! The latest expansion of a full on, state of the art, shavings mill is typical of the vision of our experienced staff. With the addition of a new building and equipment producing and shipping premium pine shavings for animal bedding and litter, we have added space for production and inventory. We have also added an additional 20 acre, bark screening site. T. H. Blue, Inc. is family owned and operated since 1976. Please contact any of us for more information. We are proud of our business and anxious to serve you! © Copyright 2019 T.H. Blue. All rights Reserved. NC WordPress web design and hosting by ConnectNC.